Ziheng is in Room 433, Darwin Building, Gower Street. See the arrow on this London street map. Darwin Building is about 8.7 minutes walk from British Museum. 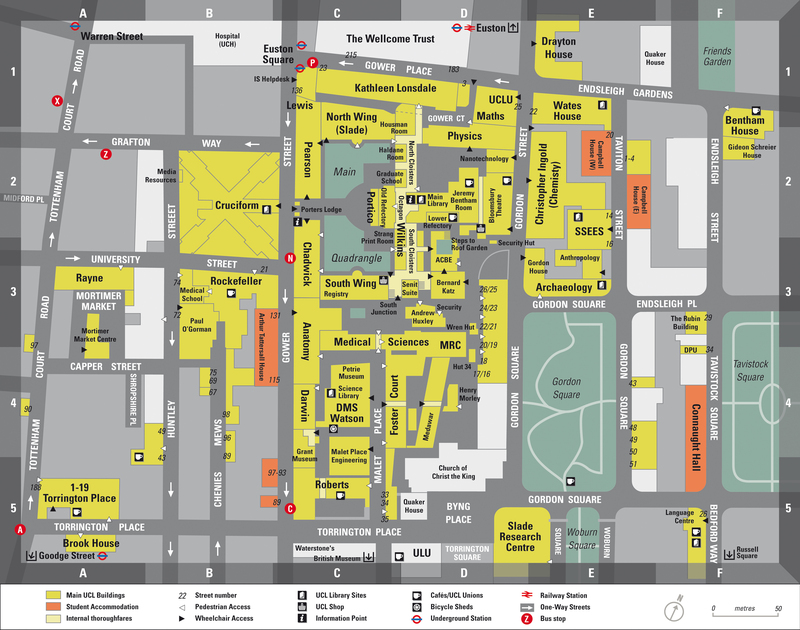 Its Entrance is at the back (via Torrington Place, Malet Place, pass the bike sheds), or you can come to the Anatomy Entrance (See the black arrows on the UCL map). Ask the Security to call me (X3-4379). Goodge Street, Euston Square, Warren Street, Russell Square, and Euston. All of them are within ~5 minutes of walk if you don't get lost. Heathrow. Take the Underground (Piccadilly Line) to central London. This takes you directly to Russel Square in about one hour. Alternatively, you can transfer to Victoria Line at Green Park and go to Warren Street. Alternatively take Heathrow Express (15 minutes, every 15 minutes) to Paddington and then underground (Central or Hammersmith lines) to Euston Square. The train ticket is about 12 pounds, and the Underground ticket from Paddington to Euston Square is 3 pounds. This is slightly faster than taking the Underground but more expensive. Gatwick. There are buses and trains to Victoria station. For example, Gatwick Express goes from Gatwick to Victoria. Journey time is about 30 minutes and the ticket costs about 12 pounds. From Victoria station, take the Victoria Line (underground) to Warren Station and then walk for 5 minutes to get to my office. Luton. The train to St. Pancras is about 30 minutes. You can then take the Underground to Euston Station, or walk along Euston Road for about 10 minutes. (This is based on fares released in January 2007) Underground tickets are priced according to zones. Our office is in Central London (zone 1) while Heathrow is in zone 6. A one-way ticket from Heathrow to zone 1 is 4 pounds. You can buy the ticket at the ticket office or at the ticket machines. Some machines accept coins only while others accept notes as well as credit cards. You can buy an Oyster Card at the ticket office at any Underground station (including Heathrow). The card costs 3 pounds, but can be used for ever. I understand that the 3 pounds is a deposit which you can claim back when you return the card but I am not very. You deposit money onto the card (which you can do at the ticket office or at the machines at any station) and then pay as you go. To use it, touch the card reader at the gate when you enter and leave a station. With an Oyster card, the single journey from Heathrow (Zone 6) to Zone 1 costs 3.50 pounds instead of 4 pounds. The difference for such a long journey is not great. However, it makes a bigger differnce for short journeys. For example a single journey in Zone 1 costs 1.50 pounds with the card and 4.00 pounds without. Thus if you plan to be in London for a few days and intend to travel again in London some days or years later, you can buy an Oyster Card. If you pay 20 pounds, you will have 17 pounds to spend.